I am now even more impressed by Lessing’s writing – it’s so beautiful and compact. Every word seems to be have been chosen with care and each story is so different from the others and yet each ends in such a way that you couldn’t really have it end in any other way. This book consists of four short novels, very different from each other (genre speaking), but similar in that they are demonstrations of brilliant writing. Perhaps the common thread between these very disparate stories is that the human condition is one fraught with difficulties and pleasures at the same time. 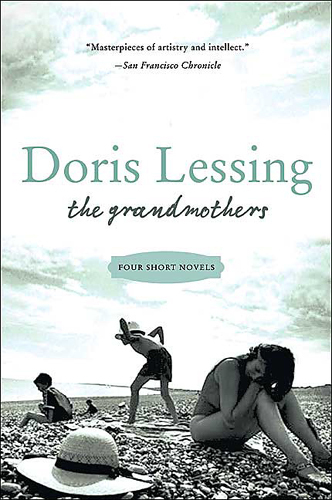 The first story, “The Grandmothers”, made me writhe at its uncomfortable story line and yet it’s difficult to stop reading it despite the ickiness factor. It’s structured in a loop that starts in the present, goes back to the past to fill in the details, and then whips you back to the present with those holes filled in. And even though the characters all engage in behavior that was a bit off, as a reader, it was possible to empathize with them all at the same time as being unnerved by them. It’s an odd balance and it’s certainly not a comfortable read, but it’s a good one. The second story, called “Victoria and the Staveneys”, addresses the issue of race in middle class England. The central character grows up in poverty and ends up falling in love with a upper-middle class family who give her a taste of an easier and richer life. Several years after the initial encounter, an unexpected pregnancy occurs and this story shows how difficult life can be for even the most well meaning of people. The third story, called “The Reason for It”, touches into Atwood territory as it veers into SciFi or perhaps spec fiction a bit. It’s about another culture in another time and its notable modern situations. It reads more like a fable to me than a lit fiction piece. That’s not to denigrate it in any way, as it’s an enjoyable read but it’s written in a gentle allegorical story-telling fashion. I liked it despite it being waaay outside my typical zone of reading. The final story, “The Love Child”, is the one that receives the most love from the critics. I must admit that now I think about it, it is a stronger and much more developed story that develops the main character, James, into a believable person. It is set in various countries but spends a lot of time in India towards the end of the Raj. James is in the English army as an officer, but seems very fish-out-of-water throughout the whole story – he feels an outcast on so many levels ranging from his upbringing and his accent to just trying to fit in with the rest of the troops. During his deployment, he comes to believe that a short and passionate fling during one of his troop ship stops had led to him being a father (despite no proof) but nothing will stop him believing it. It’s the talisman that keeps him going and affects him for the rest of life. Really great descriptions in this story – of the foul conditions on the troop ship, of the humidity of India and the coastal comfort of South Africa, of the mundane life of his family as he grew up, and a growing self-awareness – all combine to make this a story that sucked me in for the duration of reading it. As mentioned, this is not a comfort cosy read. It’s quite challenging on some levels, but it’s a really excellent read if you’re looking for a book that will stretch your brainiac muscles a bit. Lessing is a terrific writer and her backlist includes everything from operas to short story collections to non-fiction and plays, and it seems that she has won nearly all the prizes out in literature. I’m looking forward to reading more of her work – it’s the hallmark of a great reading experience. Interestingly enough, a lot of her writings are kept in archive at the University of Texas at Austin and at the University of Tulsa. I’m curious what her connection is with two schools. Novel: a long story; a fictional prose work with a relatively long and often complex plot, usually divided into chapters, in which the story traditionally develops through the thoughts and actions of the characters. Novella: a short novel; a fictional prose work that is longer than a short story but shorter than a novel. Hmm. Those aren’t that helpful. Perhaps it’s just a fuzzy area that is clear only to academics. This entry was posted in books, Fiction, TBR and tagged British, Fiction, TBR, women by lizipaulk. Bookmark the permalink. Sounds fascinating, and it’s interesting you should make the link with Atwood. I’ve read some Lessing and a *lot* of Atwood and hadn’t really put them together before, but I think you might be right about the connection – must read more Lessing! That’s a good way to describe Lessing’s writing: Beautiful and Compact. I haven’t read Lessing yet, but like the idea of starting with novellas… even more appealing because they are all so different.